Stock Exchange: Is This Trend Really Your Friend? Our previous Stock Exchange suggested to readers that they trade with more perspective, by adding new tools and techniques through which to view their trades. If you missed it, a glance at your news feed will show that the key points remain relevant. This Week: Is This Trend Really Your Friend? 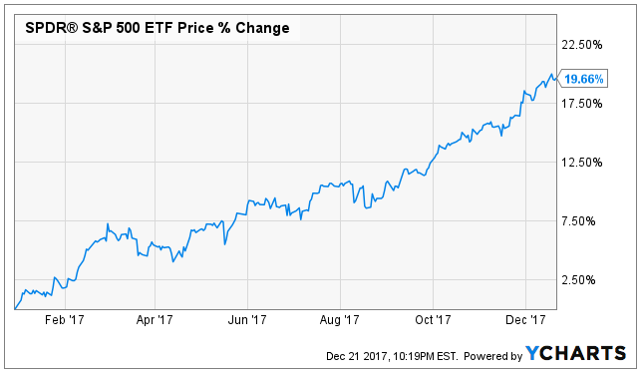 It’s no secret the stock market is doing very well this year. The S&P 500 (SPY) is up 10% in the last six months and 20% year-to-date. It’s basically for the reason Charlie describes that we use a blended approach between momentum and dip-buying in our trading models, and you can see our results in the following table (note: this table shows actual client results after commissions and fees). And just as trading strategies (e.g. 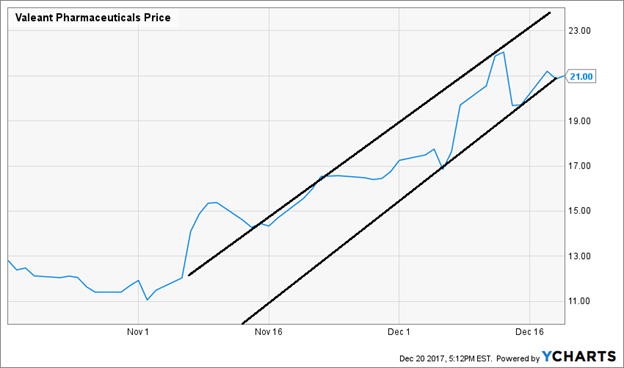 momentum, trend-following) can work great until all-of-a-sudden they don’t, so too can corporate strategies have a great outlook until all-of-a sudden things take a dramatic turn. 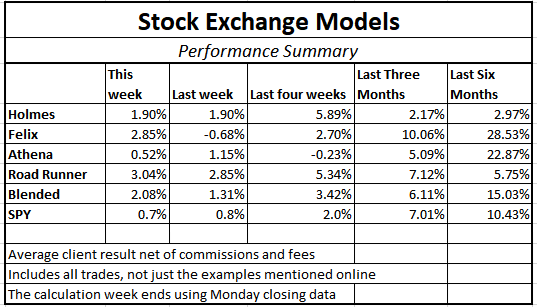 This week’s “expert picks from the models” focus trading the stocks of companies that are experiencing a dramatic change in strategic direction. 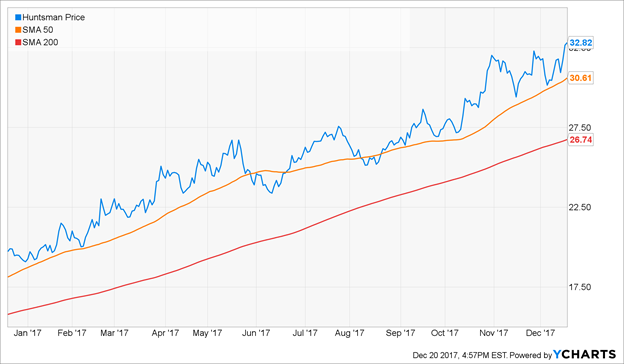 Road Runner: This week I like Valeant (VRX). I am sure you are familiar with this stock, correct Blue Harbinger? Blue Harbinger: Yes, it’s a pharmaceuticals company. Valeant is trying to focus on eye health, gastroenterology and dermatology. The stock price has fallen from over $250 per share in 2015 to about $21 per share now. 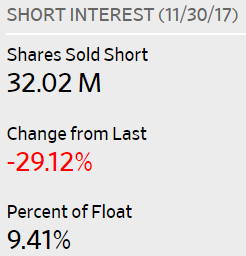 Short interest was recently very high, and the company is trying to work its way through a very heavy debt load. Valeant is working hard to change its strategic direction as shown in the following graphic. RR: That is all interesting, but as you know, I like to buy stocks that are at the bottom of a rising channel. And based on the following chart, you can see why I like Valeant right now. 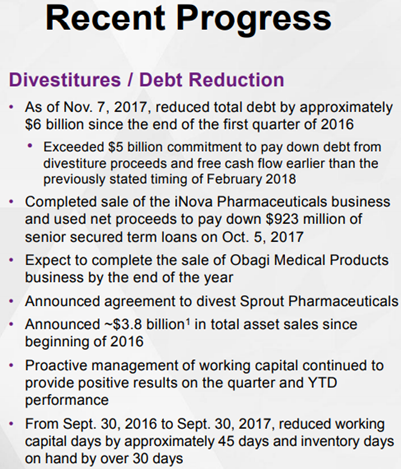 Valeant announced earnings back on November 7th, and they beat revenue expectations, and they’ve been making good progress on getting debt under control. Here is a look at some of the progress they’ve been making on their debt. RR: My typical holding period is about 4-weeks. So I’ll be in and out of this trade before the long-term fundamental story plays out. BH: Well—you have a decent track-record over the last six-months. But honestly, my time frame is more long-term, and if I had to pick, I actually like some of Valeant’s bonds more than its stock. RR: Interesting. Thanks Blue Harbinger. How about you Felix—what do you like this week? Felix: This week I like Huntsman Corp (HUN). Are you familiar with this company? BH: Yes, Huntsman makes specialty chemicals and plastics that go into things like Boeing airplanes, BMW cars and Nike shoes. This is also another company that has recently experienced some big changes to its strategic direction. For example, it recently reduced its employee headcount from 15,000 to around 10,000 when it spun off its pigments and additives subsidiary into a separate publicly traded company, Venator (VNTR). It also had big plans to merge with Clariant, but that was very recently called off after an activist investor, White Tale Holdings, acquired a lot of shares, and voted against the merger claiming the Clariant-Huntsman transaction lacked strategic rationale and undercut Clariant’s strategy of becoming a pure-play specialty chemicals company. Huntsman was very disappointed the deal couldn’t be completed. BH: How long do you typically hold your trades, Felix? Felix: I typically hold my positions for about 66 weeks—which is much longer than the other models. I exit when my price target is hit, and I use stops and macro considerations to control risks. BH: Huntsman is an interesting story. As long as the economy keeps booming, Huntsman will likely continue to do very well. 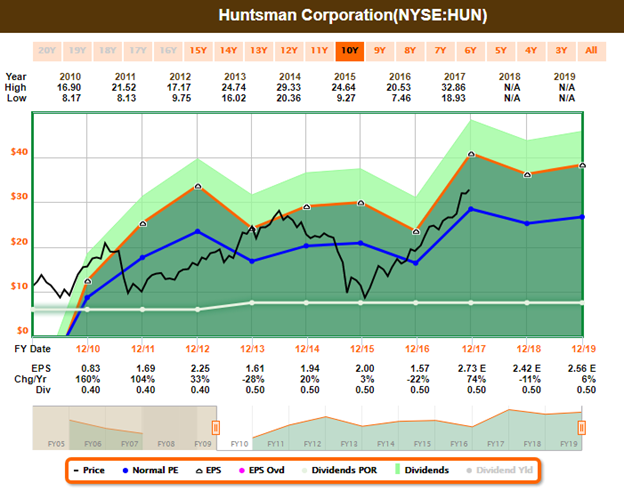 As you probably know, Huntsman is a high beta stock, even after spinning off Venator, which was a more cyclical business. Felix: I also ran the entire list of Nasdaq 100 stocks through my model, and you can see the top 20 rankings in the following list. BH: Thanks for that list, Felix. I see a lot of the usual suspects (i.e. stocks that have been performing well this year) which makes sense considering you’re a momentum trader. How about you Oscar, what have you got this week? Oscar: This week I’m sharing my top ranked ETFs from my universe of high-volume ETFs. The following list includes my top 20. BH: Thanks Oscar. That is a very diverse group of ETFs on your list. I recall from our previous conversations that you are a momentum trader, you hold for about 6-weeks, and you control risks with stock and by rotating into a new sector. Thank you for sharing this information. Strategies, whether they be trading or corporate, work until they don’t. As long as market conditions stay in your favor, so too will your strategy likely be able to deliver profits. But when the market changes direction, your old strategies may be challenged. Rather than simply sticking to what’s been working best lately (i.e. trend following), we use a blended approach (i.e. trend-following plus mean-reversion). By combining the two, we can get more diversity, lower risk, and a smoother string of returns.